After having sold more than 750,000 Apple II and II+ systems, making it one of the best-selling brands in the global computing market, Apple released an updated version of the II+, the Apple IIe ('e' standing for enhanced). It also met with very great success and was widely used in schools (still in use nowadays in some places!). While retaining the previous model's capabilities and software library, the enhanced version featured a revised logic board, keyboard and case design. Since its launch back in 1977, the Apple had been revised 13 times, but never so drastically as with this model. The IIe used only 1/4 as many integrated circuits as the II+. Its keyboard featured 4 cursor keys and a lockable lid. It was originally delivered with DOS 3.3 (the Apple II operating system) and later with PRODOS. The Apple IIe borrowed some features from the Apple III, 80-column text and lowercase support. 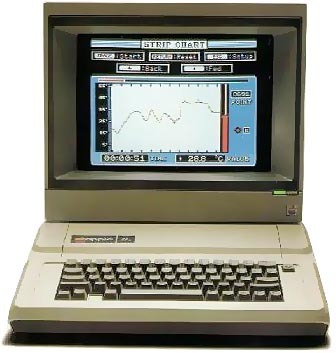 The Apple IIe was replaced with the enhanced Apple IIe in 1985, which had 128k RAM, 32k ROM, improved support for 80-column text and lowercase characters, and was powered by the 65C02 CPU, the same as the Apple IIc one. Finally in 1987, Apple released the Apple IIe Platinum, also called Extended Keyboard IIe, which had a new keyboard and other minor hardware changes. see more Apple APPLE IIe Ebay auctions !